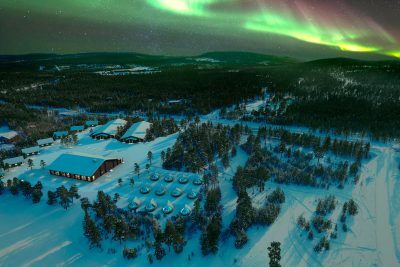 Wilderness Hotel Inari has a wonderful location by a beautiful Arctic lake in the far northern reaches of Finnish Lapland and just a few minutes from Inari village - this perfect setting combines pristine nature, breath taking views and an ideal place for aurora viewing. The wilderness resort offers all-inclusive packages with exciting winter activities, meals and transfers included, as well as accommodation in three different styles. Wilderness Hotel Inari is the new creation of Mari and Jouko Lappalainen, owners of the popular resorts Nellim and Muotka Wilderness Hotels, both of which have been big hits with our guests for many years. There are three room types to choose from this winter – wilderness rooms, log cabins and aurora cabins. The spacious rooms are located in three separate buildings, all are tastefully decorated in a rustic style and available with either queen sized beds or twin beds. Some rooms can accommodate an extra bed. Log Cabins have prime position with either a view over Lake Inari or River Nukkumajoki. They have fine Lappish detail with plenty of space and comfort – perfect for families! It comprises of a living/dining area with comfortable seating, fireplace, kitchenette, bathroom with private sauna, separate bedroom with queen size bed and a loft area with up to three single beds. The Aurora Cabins look out onto Lake Inari and offer a unique stay with glass thermal roof ensuring the window stays clear of ice, and the warmth of the cabin ensures you have a most comfortable aurora viewing experience. The cabins have twin beds and private bathroom. It is also possible to fit extra beds for children. There is a choice of different duration breaks which all include transfers from and to Ivalo airport; full board starting with dinner on the first night to breakfast on the last day; winter clothing for the whole stay and a range of different activities including husky safaris, snowmobiling, snowshoeing, reindeer farm visit and searching for the aurora. Please refer to the itinerary section for the specific activities included with each tour. The busiest time of year for Santa is December, but this year he has made a special arrangement to be available to meet the eager children and adults alike. Santa will come to your accommodation where you have private time to chat, take photos and ask as many questions as you like. Children can bring their letters to Santa and parents can ‘sneak in’ a present for Santa to hand over. Prices from per person based on two sharing, unless stated otherwise. * Note: during the Festive season the Log Cabins have a minimum occupancy of 4 persons. The prices above are based on direct flights from London Gatwick to Ivalo with Finnair (Sundays and Thursdays only). These flights operate between mid December and end of March. Alternative flights are also available via Helsinki from both London Gatwick and London Heathrow. It is possible to overnight in Helsinki and spend time to explore the Finnish Capital city before continuing the journey. The following activities are included in the different packages. Snowmobile Tryout; Husky Safari; Reindeer Farm visit; Visit to Sámi Museum Siida; Aurora Camp; Aurora Snowshoeing. Reindeer & Ice Fishing with Snowmobile; Snowshoeing; Husky Safari; Aurora Snowmobiling; Aurora Camp; Aurora Hunt by car. Lake Inari Snowmobile Adventure; Husky Safari; Gentle Snowshoeing; Cross Country Skiing; Reindeer Farm visit; Visit Sámi Museum Siida; Aurora Camp; Aurora Snowshoeing; Sámi Culture evening. Note the order of these activities will be confirmed locally and each activity will be included once during your stay. Christmas and New Year are a very magical time here in the Arctic, beautiful festive lights sparkling in the snow, decorations and tasty traditional food and cakes. On Christmas Eve, the much awaited Santa will bring a small present for children and adults alike. Toast the New Year with sparkling wine before gathering outside for bonfire and fireworks to welcome 2019! Snowmobile try out (approx.2 hours) - This is perfect for those who have never tried snowmobiling before. First you are given full safety instructions and a lesson before heading out on a small journey into the nearby surroundings. 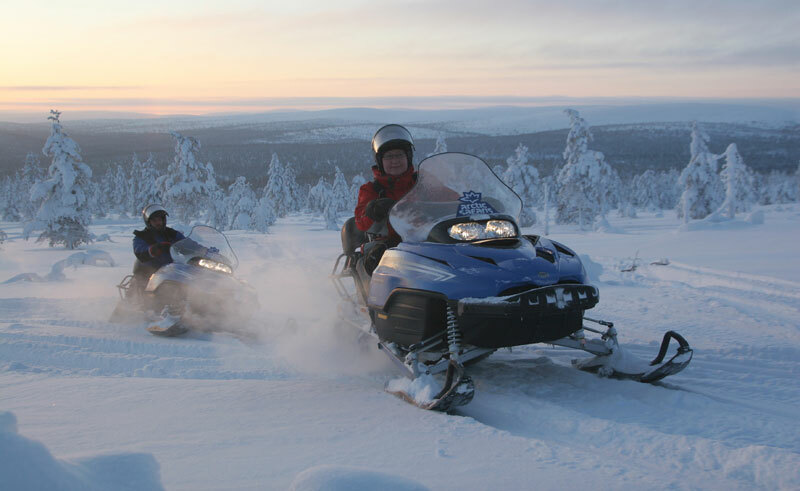 Lake Inari Snowmobile Adventure (approx.4 hours) - The guide will show you how to handle the machines, and after a full safety briefing and driving lesson you head out to Lake Inari and its surroundings. Snowmobiling through white winter scenery is a breathtaking experience. During the day, there will be a chance to try ice fishing and lunch by the open fire. Husky Safari (approx.3 hours) - Husky sledding is a must do experience when visiting Lapland. You will be taught how to drive the sled before heading out for the safari, where the huskies pull the sled through beautiful scenery. Enjoy the dog’s excitement at the start, and the serene silence once they get going. You have lunch before or after the activity, and the guide will also show you around the husky farm. Sleds are based on two people sharing, taking it in turns to drive. Gentle Snowshoeing (approx.2 hours) - This trip is perfect for anyone who wishes to try snowshoes. With gentle snowshoeing you get light exercise, and a relaxed atmosphere from the nature and peaceful surrounds. Cross Country Skiing (approx.2hours) - The traditional Finnish winter sport is definitely something you have to try on your trip. Cross country skiing used to be the most common method of transportation – there is no other method as quiet taking you through frozen and snowy scenery than on skis. The guide shows you how to use them, and once everyone is ready, you take a nice route in the surrounding nature. Reindeer Farm visit (approx.2.5 hours) - Travel by car to the reindeer farm and learn about the life of a reindeer herder and the importance of reindeer to the local people. Meeting a local herder and his peaceful reindeer is one of the top memories for many visitors. Visit to Sami Museum Siida (approx.3 hours) - Visiting the museum is a nice change from the outdoor activities. The museum is fairly small, but full of information about Sámi culture and history. In addition to the permanent exhibitions, the museum usually has other seasonal exhibits. Aurora Camp (approx.2.5 hours) - You will be comfortably seated in a sledge pulled behind a guide’s snowmobile and driven to one of the chosen camp spots where an open fire and hot drinks keep you warm while waiting for the sky to show the magical northern lights. Aurora Snowshoeing (approx.2.5 hours) - Experience the atmosphere of old forests on this relaxed snowshoe walk in the evening to the aurora camp. Walking in the dark forests with the moon as your light and dancing lights overhead is unforgettable. Warm up by the camp fire with hot drinks before returning. Sámi Culture evening with Lappish dinner (approx.2.5 hours) - You are presented with information about Sámi culture from an authentic Sámi dressed in traditional costume. During the evening you are served Lappish foods and delicacies. Reindeer & Ice Fishing with Snowmobile (approx.4 hours) - meet an authentic reindeer herder and learn about his semi-wild animals and about life in the north. There is also the chance for a short reindeer sledge ride at the farm, as well as snowmobiling and ice fishing with lunch by the open fire. Snowshoeing (approx.4 hours) - A calm and peaceful way to enjoy the beauty of the snow covered forest - spot animal tracks in the snow and if you're lucky, also meet some wildlife. Lunch by the open fire is included. Aurora Hunt by Car (approx. 2.5 hours) - Depending on weather, you will try to chase the aurora by heading for one of the specific camp spots and if needed head further out in search of the amazing lights. During the trip warm drinks and snacks are included. A beautiful new wilderness hotel situated in Inari, next to the lake offering wonderful views at all times of the year.